CRAIG VENTER: One of the exciting elements that people who are interested in the digital world here may find is we can use the genetic code to watermark chromosomes. You can use it in a secret code, or you can—basically what we're using is the three-letter triplet code that codes for amino acids. There's 20 amino acids, and they use single letters to denote those. Using the triplet code, we can write words, sentences, we can say, "This genome was made by Richard Dawkins on this date in 2008." A key hallmark of man-made species, manmade chromosomes, is that they will be very much denoted that way. RICHARD DAWKINS: What has happened is that genetics has become a branch of information technology. It is pure information. It's digital information. It's precisely the kind of information that can be translated digit for digit, byte for byte, into any other kind of information and then translated back again. This is a major revolution. I suppose it's probably "the" major revolution in the whole history of our understanding of ourselves. It's something would have boggled the mind of Darwin, and Darwin would have loved it, I'm absolutely sure. Click here for the complete one hour video of the event. 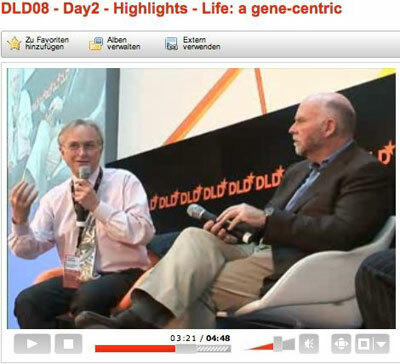 STEFFI CZERNY (Hubert Burda Media/DLD): John Brockman is talking to Richard Dawkins and Craig Venter. This is a very special thing, and we are very grateful, John, that you brought this panel together. We have known John for a long time. He always inspired us a lot. He was the one who introduced me to the term "digerati." And now he's introducing all of you to the most essential issue of the new century. JOHN BROCKMAN: Thank you, Steffi and thank you all for coming. It's not every day you have Richard Dawkins and Craig Venter on a stage together. Richard Dawkins is responsible for possibly the most important science book of the last century, The Selfish Gene, published in 1976, which set forth an agenda of the gene-centric, or gene's eye, view of life, which has become the basic science agenda for biologists for the last quarter century. And without that worldview, you wouldn't have Craig Venter changing the world the way he is today. Craig Venter is the man who led the private group that decoded the humane genome in 2001. He's working on the forefront of artificial life, synthetic biology. He's traveling around the world on a sailboat finding millions of new genes in the oceans and in very dramatic fashion. And most recently, in June, his lab was responsible for transplanting the information from one genome into another. In other words, your dog becomes your cat. What we'll do first is a conversation between Craig and Richard, and then if any of you have questions, please raise your hands. DAWKINS: I thought I'd begin by reading a quotation from a famous philosopher and historian of science from the 1930s, Charles Singer, to give an idea of exactly how much things have changed. And Craig Venter is a leader, perhaps the leader, in making that change today. So, this is a quote from 1930, Charles Singer: "Despite interpretations to the contrary, the theory of the gene is not a mechanist theory. The gene is no more comprehensible as a chemical or physical entity than is the cell or, for that matter, the organism itself. If I ask for a living chromosome, that is, for the only effective kind of chromosome, no one can give it to me, except in its living surroundings, any more than he can give me a living arm or leg. The doctrine of the relativity of functions is as true for the gene as it is for any of the organs of the body. They exist and function only in relation to other organs. Thus, the last of the biological theories leaves us where the first started in the presence of a power called life, or Psyche, which is not only of its own kind but unique in each and all of its exhibitions." You couldn't ask for a more comprehensive destruction of a conventional view than that. That is not just wrong. It is catastrophically, utterly, stupefyingly wrong. It's wrong in an interesting way, and Craig is the best person to tell us what's wrong with all that. VENTER: I feel like this is a quiz, Richard (chuckles). As you heard from John, Richard's book on The Selfish Gene really influenced most thinking in modern biology. I actually didn't like his book initially. I've never told him that. I figured it was safer at a distance now. But I've come to appreciate it immensely. I was looking at the world from a genome-centric view—the collection of genes that put together to lead to any one species—but as we traveled around the world trying to look at the diversity of biology, we came up with larger and larger collections of genes. We now have a database of roughly ten millions of these. That number will probably double again this year to 20 million. To put it in context, we as humans only have around 22,000 genes. We represent sort of a minority of the usage of genes on this planet. But I've switched, and I've really come to view the world from a gene-centric point of view, in part, because we're now going into the design phase. I'm looking at genes as the design components of the future, not just interesting elements of biology. I now look at genomes as interesting composites of genes. But we have almost an infinite variety that we could put together to create biological machines of the future. Unlike that quote, chromosomes can exist independently. Genes can exist independently. They can move around independently. Regarding the study that John was referring to in the introduction—last year, we isolated the chromosome from one bacterial species and transplanted it into another one. The chromosome in the species that we transplanted into was destroyed, and all the characteristics of one species went away and got transformed into what was dictated by the new chromosome. It's sort of the ultimate test in proving that this is the information of biology and dictates what a cell can do and maybe even should do. This was a precursor to being able to now design life, build synthetic molecules by looking at individual genes. We now have some gene families where we have 30, 40, 50,000 members—natural variants that occur in the population. And we have major problems we're trying to overcome by looking for solutions, changes in modern society. The first uses we're trying to put these to is trying to come up with alternate ways of making fuel. Instead of taking carbon out of the ground, looking at this diversity of biology, we have thousands, perhaps tens of thousands, of organisms that can take the energy from sunlight, carbon dioxide from the environment, fix the carbon from the carbon dioxide and also make a potential fuel—natural gas such as methane. When we look at cells as machines, it makes them very straightforward in the future to design them for very unique utilities. All these speak against that one quotation. DAWKINS: It's more than just saying that you can pick up a chromosome and put it in somewhere else. It is pure information. You could put it into a printed book. You could send it over the Internet. You could store it on a magnetic disk for 1,000 years, and then in a thousand years time, with the technology that they'll have then, it will be possible to reconstruct whatever living organism was here now. So, this is something which was utterly undreamed of before the molecular information revolution. What has happened is that genetics has become a branch of information technology. It is pure information. It's digital information. It's precisely the kind of information that can be translated digit for digit, byte for byte, into any other kind of information and then translated back again. This is a major revolution. I suppose it's probably "the" major revolution in the whole history of our understanding of ourselves. It's something would have boggled the mind of Darwin, and Darwin would have loved it, I'm absolutely sure. BROCKMAN: And for this conference it's almost as important as advertising online. VENTER: Well, to speak to this, for the past 15 years, we have been digitizing biology. When we decoded the genome, including sequencing the human genome, that's going from what we consider the analog world of biology into the digital world of the computer. Now, for the first time, we can go in the other direction. With synthetic genomics and synthetic biology, we are starting with that purely digital world. We take the sequence out of the computer and we chemically from four raw chemicals that come in bottles, we can reconstruct a chromosome in the laboratory, based on either design, copying what was in the digital world, or coming up with new digital versions. In fact, somewhat jokingly, we can argue that this is the only nanotechnology that actually works. Biology is the ultimate nanotechnology, and it can now be digitally designed and reconstructed. DAWKINS: There are people who are very uneasy about this kind of science. They sometimes call it scientism. And there's a certain suspicion of arrogance. The phrase, "playing god" has been brought up. I don't think I have a problem with that, but I think it's something we ought to take seriously. What I do have a problem with is the possible unforeseen practical consequence of some of the sorts of things that not just you are doing, but many other people are doing. I suspect that the phrase "playing god" is actually a kind of, it's a bit like the boy who cried ‘wolf', because accusing a scientist of playing god is obviously stupid. But what is not obviously stupid is accusing a scientist of endangering the future of the planet by doing something that could be irreversible. And what I mean by the boy who cried wolf is that we may become so used to fending off idiotic accusations of playing god, and, thereby, humanity might overlook the real dangers. Do you think that's a possible danger? VENTER: It's a real-life danger that we're facing now. I've argued that we are 100 percent now dependent on science for survival of our species. In part, science of today has to overcome the scientific breakthroughs of previous years because we've advanced internal combustion engines, because we're so good at burning carbon that we take out of the ground, we did it blindly without any consequences of, that it might totally affect the future of the planet. Now, the numbers—and I've had to change my slides three times last year of the amount of carbon that's going into the atmosphere and staying there—that number is now 4.2 billion tons of carbon. It's accelerating faster than anybody projected. My slide at the start of 2007 was 3.5 billion tons of carbon. It's expected perhaps with increasing industrialization of China and India, within 20 to 40 years, that number could be on the order of 20 billion tons of CO2. There are several environmental scientists that have argued that there is almost nothing we can do to reverse that, though. We may be fixed in our destiny regardless of whether we have new approaches. I don't like that scenario. We have to try and do something. I hope those people are wrong with their projections. If we can do two things—number one: replace using the carbon we're taking out of the ground by using renewable sources, and the best renewable source we have is energy from the sun. Over 100 million terawatts a day hit the earth. We have cells that capture carbon back from the environment. And it turns out, chemically and biologically in the lab we can make anything in the lab that come out of the ground in terms of carbon. We can make octane. We can make diesel fuel. We can make jet fuel. We can make butanol. Ethanol, humanity's been that forever through simple fermentation. These are ideas that are slow to catch on. Very much in the notion that you were talking about. People are much more concerned that there might be new consequences of engineering biology than this potential disastrous route we're on—totally changing our atmosphere, maybe making it impossible ultimately for our species to survive. That's a far more dangerous experiment. DAWKINS: Did I understand you to be saying that whereas the energy we get out of the ground—oil and coal—took millions of years of all those terawatts of sunlight hitting leaves in the Carboniferous and being stored, do I understand you to be saying that now, with the biotechnology that you are doing, it should be possible to capture those terawatts of energy on the fly, as it were, and use them in the present rather than stored over millions of years from the past and dug out of the ground? VENTER: Exactly. What we're doing with burning oil and coal is we're taking millions of years of compressed biology, we're burning that over the course of years and putting it in the atmosphere. We can do just the opposite. We can even capture back some of that CO2. It only takes about one percent of the sunlight that hits the earth daily to replace all the fuel we use, all the energy we use for transportation. These are not huge leaps. There's just been no motivation for it because oil was cheap. We've gone through this cycle, two times now, where people rapidly pursued alternate energy sources, then the cost of oil dropped. In fact, that's my biggest concern now. The price of oil is in the hands of very few people. And if there's truly alternatives that come on the market, the cost of oil could be artificially dropped to really low prices killing off these new industries that are essential. The way forward in a political sense is there has to be a carbon tax on nonrenewable carbon to disincentivize people from burning this carbon that's nonrenewable that is going to take us down this route that I think people have—even the Bush administration recognizes that we're in the realm of client change due to carbon going into the atmosphere. If they understand it, the rest of the world can. BROCKMAN: At "Life, What A Concept!" meeting, Freeman Dyson, who's extremely heretical, basically challenged Richard by saying evolution is now back to pre-biotic stage of communal, horizontal gene transfer, and with the interlude of what he would call the "Darwinian Moment". Richard rebutted that in an email. It's rather exciting reading, and you can get it on The EdgeWeb site and download it. But the question I have is: Dyson maintains that evolution is now man-made; it's cultural rather than Darwinian, Open Source, communal. Is it? VENTER: All evolution is based on selection. We as species have been affecting the direction of evolution whether we wanted to or not for some time by changing the environment. Now we can do it in a deliberate, hopefully thoughtful, fashion by deliberate design. But that deliberate design still has to be followed by selection. But looking back at how even the early processes of evolution that Richard's been writing about for so many years, when we look at that same experiment we did with transplanting a genome from one species to another, so many people that tried to argue against evolution on a religious basis try to stick to this point mutation and selection mode, the most limited version of Darwinian evolution, to point out how complexity couldn't occur from that. What we see with chromosome transplantation is, we can get a million changes in a species in an instant. And not only does this happen just by our work in the lab, looking back in history, we see major species evolution was from species taking on new chromosomes. When they take on a new chromosome, it's like adding a new DVD full of software to your computer. It instantly changes the capabilities and the robustness of what you can do. Our cells can do that. I guess it's by definition Open Source because it happens in the environment almost on a daily basis. We have real-time Darwinian evolution taking place in our lungs. Everybody in this room has a different species of bacteria in their lungs because, as your immune system attacks these organisms, there's built-in mechanisms to the genetic code where they're constantly making minor variations, making different proteins to fool our immune system. Selection—this is case selection by our antibodies, and our physiology is changing those—we're changing selection of the species, perhaps ones that will survive in a higher CO2 environment. As we sailed around the world, one of the most disturbing things was we could barely go a mile in the ocean without seeing plastic trash. We'd go to beaches that—we did not anywhere in a complete circumnavigation see a pristine beach without it being covered with trash. But talk about a new environment, after the major tsunami, as we sailed across the Indian Ocean, all the beaches were covered with flipflops. But they turned into rafts for crabs. So we have a new habitat for crabs as they float around the ocean on people's flipflops. We are very much affecting evolution on our planet. My contention is, we need to start doing it in a very deliberate fashion. DAWKINS: I want to come back to John's point about Freeman Dyson. And I didn't actually disagree with him all that much. The only thing I disagreed with him was that he was talking about natural selection as though it was selection between species, which it is not. However, the extremely interesting point he is made is the transition from a very early stage of evolution, which was much more Open Source, because bacteria still copy and paste information in a kind of promiscuous fashion, which is exactly what we are now in a position to do both genetic information through people like Craig but also other kinds of information, cultural information. So, there is a really interesting sense in which there was, still is, a middle phase of what Dyson called the Darwinian phase, by which what he really meant was the highly ritualized phase of sexual exchange of information which, as I say, is ritualized, as opposed to the Open Source system, which bacteria still do, and which human biotechnology now does. By ritualized, what I mean is that in every generation, exactly 50 percent of the genes of a male and 50 percent of the genes of a female are put together to make a new individual. Now, that is a highly stylized, ritualized, courtly kind of genetic information exchange, which took over from the bacterial system and which caused the invention of what we call a species, because a species just is a collection of individuals who are taking part in this stately gavotte of genetic exchange. Having usurped the earlier stage of promiscuous shoving genetic information around all over the place, and we're moving back into a new promiscuous phase. However, I wouldn't write off what Dyson called the "Darwinian Phase". It's been going for a couple of thousand million years and it's going to go on all around us, never matter mind what humans are doing. I mean, the rest of life is going to go on like that. VENTER: You did use the phrase "schoolboy howler". DAWKINS: Schoolboy howler. I did use the phrase, "schoolboy howler", and that was about that one point, about suggesting that natural selection is about one species displacing another species, and that is, that is a schoolboy howler. A lot of people think that Darwinian selection means one species goes extinct and another species takes over. That is not Darwinian selection. That is species extinction. It's a totally different kind of process. BROCKMAN: Speaking for Freeman. He still maintains he's correct. One interesting aspect is that in science, debate is the way people work together, the way they advance their ideas. It's usually civil. In this case, it was very good-natured. The two major German newspapers, Suddeutsche Zeitung and Frankfurter Allgemeine Zeitung, were present, and they both ran feuilleton features on the event. And one of them said, if this discussion was in Germany, there'd be riots and fist fights. But the audience here all seem so calm. VENTER: Let me pick up on a point that Richard was making about the simplistic notions about Darwin and evolution. In fact, it was one of the biggest surprises for the scientific community. What we found in the environment. Most people expected just one dominant species. What we found were thousands, tens of thousands, of very closely related organisms, all basically the same linear set of genes, tremendous variation in those genes. But there was not one dominant one. There was this community of related organisms where perhaps none of them had gone extinct, or, if they had, there were literally thousands of ones to replace them. The problem we've had, I think, with looking at evolution, I think it's been overly simplified because we've always been looking at the visible world, not the absolute majority of life on this planet, which is the invisible world. In one milliliter of sea water, there's a million bacteria and ten million viruses. In the air in this room—we've been doing the air genome project—all of you just during the course of this hour will be breathing in at least 10,000 different bacteria, and maybe 100,000 viruses. I would look closely at the person sitting next to you to see what they're exhaling. This is the world of biology that we live in, that we don't see, where evolution takes place on a minute-to-minute basis, not on the speciations of giraffes versus elephants versus kangaroos but the tens of millions of species that constantly are affecting the metabolism of our planet. The air that we breathe comes from these organisms. The future of the planet rests in these organisms. And the question is: If we take over the design of these organisms, does that really shift the balance in any way? Or is it such a small portion of what's out there that we'll only affect industrial processes not the living planet? DAWKINS: My vision of life is in a sense even more radical than that, because I would like to regard the genomes of the giraffes and kangaroos and humans that you refer to as just another set of viruses in close-knit societies. So the gene pool, I should say, of giraffes, or the gene pool of humans, or the gene pool of kangaroos is a huge society of viruses. I'm using the word loosely. I'm using the word "viruses" because the viruses you're talking about, the bacteria you're talking about, are kind of free spirits who are out there in the sea, and they're out there in the air. But there's another whole class of them who have, not agreed, but who have come together in gigantic clubs, gigantic societies, which is you and me. And so, as far as a piece of DNA is concerned, there are just various ways of making a living. And some of the ways of making a living are floating around free in the air and floating around free in the water. Other ways of making a living are to club together with other bits of DNA, making a genome, and influencing the phenotype, influencing the body in which they sit to pass them on to future generations. These are just different ways of making a living. The whole of the biosphere is a gigantic collection of crisscrossing interacting DNA, some of which jumps from kangaroo to kangaroo, or from giraffe to giraffe, but via the normal route of reproduction, sexual reproduction, others of which jump around through the air or through the water. But it's all the same kind of stuff. VENTER: In fact, the jumping I think is a lot further; they can jump from planet to planet. We have organisms that can withstand three million rads of radiation. They can be totally desiccated. It's been shown that they can survive easily in outer space. We exchange roughly 200 kilograms of material between Earth and Mars each year. Undoubtedly, we're exchanging these organisms. It's a question of how far they can transfer. We're starting to look at the gels from space dust to see if we can find DNA in them. These organisms, if they were shielded within a comet within any other material, the estimations that we came out of this conference could literally last tens of millions of years, find a new source of water and start replicating again. Our viruses can affect the universe just not the girl next door. VENTER: Well, in fact, the thinking was remarkable, looking back at history, as Europeans went out to look at other continents, they were expecting the equivalent of space aliens on these different continents. We seem to extrapolate much more in our imaginations than we do in life. I'm certain we will find bacterial life on Mars, whether it's actively replicating or not still is a question. But it won't differ from what we have on this planet. DAWKINS: But it'll be Earth. VENTER: Because it will either have originated there and come here, or originated here and become contaminated there. VENTER: Dimitar says there's in our own galaxy 100,000 Earth or super Earth planets, just within our own galaxy, that could all support life. We will find life as a universal concept. Anywhere we will find highly intelligent life, we will find it's a design concept. It's an electronic concept. It's an information concept. We can transfer life across the universe as digital information. Somebody else could in their laboratories build that genetic code and replicate it. Perhaps publishing my genome on the Internet had more implications than I thought. BROCKMAN: When you talk about design, you're inferring that life is a technology. Would that be true? VENTER: Life is machinery. Life is a ... it becomes a form of technology as we learn how to engineer it and reproduce it. BROCKMAN: One of Richard's colleagues, J.Z. Young, at Oxford, in his 1951 Reith Lecture, said we create tools and we mould ourselves through our use of them. So if life has moved from reality to a tool to a technology. How is that going to change our view of who and what we are? VENTER: It's a question that's sort of come up from the beginning of looking at the genetic code. Many argued that we would diminish humanity by looking at our own genetic code and understanding it. That's a very simplistic view. From even with our species, looking at our genetic code and trying to understand how we go from the same 22,000 genes in every one of our 100 trillion cells to a John Brockman and a Richard Dawkins is far more fascinating than anybody can conjure up I think from any religious or poetic form. I don't think it diminishes humanity to understand it. BROCKMAN: It sounds fascinating now. Twenty-five years from now, it'll sound, to the next generation, trite and taken for granted. Things are going to change. With this scheme of things, I don't see any place for religions. I think we're going to relate to each other differently. The whole cybernetic idea is a huge epistemological breakdown of our traditional ways of looking at each other. We go down an empirical road, until it hits a wall, and you have to rethink everything. And that's where we are right now. VENTER: Well, it certainly changes the definition of an Internet virus. If we can have an actual virus, digitize its code, we can transmit it around the Internet and somebody else could build that same one, or more importantly, a cell to make octane from carbon dioxide based on sunlight. We need to get these transfers very quickly. We are a species that everything is out of sight and out of mind. While we worry about GMOs, primarily in Europe, I worry most about the several trillion organisms that get transferred as ballast water that they pick up in any port after they dump their cargo, take that to another part of the world, and contaminate that part of the world with all those microorganisms and viruses. This has been going on ever since ships have taken on ballast water. We are doing a cross-contamination. The experiment that Darwin did, every time a ship takes on ballast water, it moves some place else and dumps that water, they're moving billions to trillions of organisms and viruses around to create environments that wouldn't normally exist. BROCKMAN: The audience might interested in your adventures with national governments in your surveying their waters in the South Pacific. VENTER: What John's referring to, it's actually almost impossible as a modern scientist today to do what Darwin was able to do. On his voyage, he, on a survey ship, going around, first South America, took biological samples, characterized them everywhere he went. We now have international treaties that every country owns every species within 200 miles of its borders. So we found, as we sailed across the Pacific Ocean with a one-knot current that carried a million organisms per milliliter of ocean water across a border, they went from organisms that were international organisms to become French genetic heritage. And it changes the ownership. It changes the view of science. Where most states now don't want discoveries made and that information published on the Internet or published in scientific journals. So we've gone the extreme opposite of Open Source to it's very hard to find a country that doesn't want to block the publication of information of biology that's either originated in that country or drifted across its borders. BROCKMAN: At the "Life: What a Concept" conference, you said something about artificial life—that it's not "if", it's "when"; that it's happening, and it's going to happen sooner than we think. So, what is the prognosis on that? VENTER: Well, just for the record, we have not yet created a cell driven by a man-made chromosome. Based on the chromosome transplant experiment, though, we know that that is definitely possible. There's a lot of barriers to it. There's different mechanisms in cells where, because these are in fact key mechanisms of evolution, if you're a cell swimming in the ocean and not only you take up a gene but you take up a whole chromosome from another species, and it instantly transforms what you do as a species, some species wanted to develop mechanisms to protect them against that. There's a lot of barriers we have to overcome. I'm hopeful that will happen this year. DAWKINS: Can I talk a bit about some of the risks? Craig, you were just talking about the sort of almost criminal contamination of oceans when tankers release ballasts of seawater, and, thereby contaminate one ocean with the organisms of another. And we're all now quite used to the idea of contamination of organisms. When you go to New Zealand, you hear thrushes and blackbirds, because the early settlers felt nostalgic for British birds, and wanted to bring British birds. I mean, it's criminal. The Duke of Bedford imported American grey squirrels into Britain, and now the red squirrel is all but extinct. We're entirely used to this idea of contamination. However, what's the equivalent that we might be doing now? What if scientists of the future are unable any longer to do serious molecular taxonomy work because the scientists of the 20th and 21st Centuries, let's say 21st and 22nd Centuries, contaminated genomes by introducing genes from other radically different parts of the living kingdoms? It's probably all right, as long as very, very careful records are kept. However, you could imagine a situation in the future where the rather strict separation, at least in Freeman Dyson's middle stage of evolution, the sexual phase, where on the whole evolution is all divergent, there's virtually no cross-contamination of genes, if humans suddenly start cross-contaminating genes, so you have kangaroo genes in giraffes or melon genes in aardvarks, how are we going to do our molecular taxonomy? Won't it be a bit rather like people trying to study the faunas and ecology of New Zealand? VENTER: Richard, that's the most naive question you've ever asked. And I assume you're asking it to be provocative, because in fact that's the opposite of what we see happens with evolution. Viruses move genes around from totally disparate species in a very common fashion. We have genes in our genome that resemble some, you know, from distant viruses. In fact, a third of our genome is basically viral contaminate. When we sequenced the small pox genome, the small pox genome had half a dozen clearly human-derived genes. We see bacterial genes moving in a lateral fashion from archaea to bacteria to plants to single cell eukaryotes. We do have constant information exchange across the diversity of species on this planet. I've never heard the term until this meeting, that of the "schoolboy howler", but I would put that in that category, the simplistic view of biology. DAWKINS: Are you saying, then, that a molecular taxonomist who's trying to work out, say, the taxonomy of marsupial mammals or placental mammals would be thrown out because a bacterium or a virus has at some point carried across a kangaroo gene into a jackal genome or something ... You're not saying that. Are you? VENTER: We're saying that we see evidence of every branch of life in almost every genome. It depends on which gene you choose, and that's been the problem with molecular taxonomy. If you choose one gene out of two or three thousand in a genome and try and classify it on that, you come up with one answer. If you pick another gene, you get a different tree. If you try and look at the genome as a whole, you get a totally different answer. So yes, we see genes moving around. You know, the visible world and these few visible species to me are somewhat bizarre, extremes of evolution. They're not the standard. But if you look in those, in the marsupial versus, you know, a platypus genome, you would definitely find a clear cut similarity. If we sequenced another mammalian genome, we would not discover a single new gene. We would discover unique combinations that made that mammal versus us. But we have saturated the gene set for mammals. So we can pronounce and say here ... but the gene set of mammals, over half of those are shared broadly with other species. You can't draw a bright line in every gene, and say, "These are plants and these are mammals. These are humans and these are marsupials, " because we've used—it gets back to the gene-centric view. We've used those in the random design of biology, as we will use them in the very specific design that we do in the laboratory. And taxonomy is something where people sort of fool themselves by justifying what they see with their visual acuity. DAWKINS: The overlap of mammal genes that you're talking about could come about through common ancestry. So the platypus and kangaroo genomes contain shared genes because they go back to a common ancestor. That is the normal assumption that's made by molecular taxonomists. VENTER: Yes but once you have lateral transfer, whether it's due to viruses or anything else, the tree concept of life goes away. DAWKINS: That's what I'm asking you. To what extent does molecular taxonomy now have to be, not overthrown but at least thought of with great suspicion, because you cannot tell which genes are in common because they're shared in a common ancestor or because they're cross-contaminated by viral or bacterial transfer? VENTER: One of the exciting elements that people who are interested in the digital world here may find is we can use the genetic code to watermark chromosomes. You can use it in a secret code, or you can—basically what we're using is the three-letter triplet code that codes for amino acids. There's 20 amino acids, and they use single letters to denote those. Using the triplet code, we can write words, sentences, we can say, "This genome was made by Richard Dawkins on this date in 2008." A key hallmark of man-made species, manmade chromosomes, is that they will be very much denoted that way. You could obviously copy something that was out there and make minor variations and nobody would necessarily know. But the other key tenet of what we're doing is the organisms that we're designing, that other people are thinking of, are designed not to survive outside of the lab, outside of a production facility because they have very strict requirements for it. I don't know anybody that's advocating making a new specie and throwing it in the ocean to get better conversion to put more oxygen in the atmosphere. BROCKMAN: I'm sure some of you have questions? QUESTIONER: I have a question for Richard Dawkins. You've known Craig Venter for quite a while and you remember ten years ago, when the world was too slow for him sequencing the genome, and he said, "I want to do it myself. I want to do it quicker." Now he announces that he wants to create artificial life to resolve the energy crisis and bring the oil price down and create new forms of energy. When will he come up with the first form of energy? DAWKINS: You're asking me a question about Craig. QUESTIONER: Yes. I asked him already a couple of weeks ago, and he didn't say anything about the timeline (Laughter). VENTER: So supposedly I told you in secret what the real answer was, and you're going to reveal it now. DAWKINS: I'm not going to reveal anything. I want an answer from Craig about the kangaroos and the— (Laughter) I think you're confusing two quite different things. I mean, of course you can make viruses and bacteria transfer things, and we know there are a few genes that have cross-contaminated from radically different parts of the animal and plant kingdoms, but I didn't know until you told me today, and I'm skeptical about it, that molecular taxonomy of, for example, mammals, is endangered by cross-contamination of genomes. I don't believe molecular taxonomists yet, at least, say, "Oh, well, we can't use this gene to get our kangaroo taxonomy right, because it's clearly been imported from a rhinoceros." VENTER: So when we look at bacterial evolution, a typical bacteria will have 2,000 genes in it, each one of those 2,000 genes has its own separate evolutionary tree that you can construct, and none of them have the same time line that you could put together. VENTER: But that's bacteria. So, viruses pick up bacterial genes all the time. They pick up mammalian genes all the time. A third of your genome is virus. It's not just you personally. It's, all of us have that. And there are subtle differences in those, that if a taxonomist was to measure viral genes, unmistakingly thinking it was a human gene, they would come up with a very different answer than one that was in the human lineage, perhaps from the beginning. QUESTION: You mentioned that there's 100 trillion cells in our body, so to speak. A hundred trillion. Right. Aren't most of them non-human? Aren't we really dependent on, for our life, to have a lot of animal cells in our body? And in essence, are we not a human but a zoo? QUESTION: So we are a zoo? VENTER: Well, we're, it depends, there's not too many bacterial zoos. But an important part of human metabolism, human diet is, you're not so much what you eat, as people say, you're what you feed the bacteria in your gut. So when we look at the chemicals in the blood after a meal, there's roughly 2,500 compounds that we as a species can make. We see roughly twice that many as bacterial metabolites in our guts from what we feed them. So, we live in a bacterial milieu. We breathe it. Our guts, every orifice, our skin; we have more bacterial cells than we have human cells, and they're a very key part of our existence. We can't exist in a healthy life without them. So that could be a zoo, if you had a microscope. QUESTION: I have two questions, actually. One referring to Richard Dawkins' latest book, The God Delusion. And I would like to know from Venter how happy had he been about this book, because, well, if there's no God, you can't tinker with Genesis. So, you don't have any ethical problems with that maybe. The second one is: Do you think that humankind is overtaking evolution? So, well, it will happen in the lab and not in the natural environment anymore? DAWKINS: The first question seemed to be rather a strange question. It mentioned my book, The God Delusion, Der Gotteswahn. And then said, "What's Craig Venter's attitude to that because"—and I didn't quite understand what the "because" was, but something to do with, "he doesn't have to worry about Genesis anymore." I don't suppose he ever did worry about Genesis (Laughter). VENTER: I guess the assumption is, we can't play God if there is no God (Laughter). DAWKINS: All the more reason to do so. QUESTION: In response to Mr. Brockman's annual Edge question where have people changed, where have you, for example, changed your minds, where have the two of you changed your minds? And could you comment on Steven Pinker's response to that question, where he stated that he once thought that humans were essentially not evolving anymore, but now he believes that they are? DAWKINS: Right. The questioner points out that John Brockman's EdgeWebsite this year has a question, "When have you changed your mind and why?" And it ended up with the statement that Steven Pinker had changed his mind about whether humans had stopped evolving. I answered the question about changing my mind, and I won't give my answer because it takes too long to explain. However, I will say that in response to Craig Venter today, I am prepared to change my mind, if he gives a better answer to my question about molecular taxonomy. Maybe now is not the time to do it. But I'm on the brink of changing my mind, but I remain highly skeptical as to whether I will in fact have to do so. VENTER: We'll have to go through some genome data as we follow up on this ... I think Pinker thought there was no human evolution because he spent so much time at a university (Laughter/Applause). QUESTION: We've talked a lot about design and technical things. How about soul? Science tried to figure out where our souls sit. Where is it in your mind, Mr. Venter? DAWKINS: The question is about: Where does the soul sit? Either the soul doesn't exist at all, and I don't believe it does exist in the sense of anything outside the brain, or it is a manifestation of brain activity. I certainly would think it highly, highly unlikely that there's anything like a soul that survives the death of the brain. So I think that one of the aspects of the revolution in biology is a complete destruction of dualism and of obscurantist mystification. QUESTION: Craig's comment about being able to, perhaps in the future take carbon dioxide out of the atmosphere and create fossil fuels, good ones because one's not digging them out of the ground, is admirable. Of course, it's always dangerous to try and predict what kind of future technologies will be. But it seems that, to me, there are two classes of technological solutions that might be able to use your invention, when you come up with it. One would be some kind of black box that takes the carbon dioxide in the immediate vicinity of black box and converts it into fuel. And the problem here is that you only have about 400 parts per million of carbon dioxide in the atmosphere. So you would require an enormous amount of processed energy to be able to get enough carbon dioxide to make the kind of quantities of fuel that we need. The other broad class of technological solution would be perhaps you could create some kind of enzyme, or whatever you would call it, but take advantage of the huge surface area of the oceans, and you could sort of, then, put it in the ocean and then it would then take carbon dioxide out of the atmosphere and convert itself into oil. But then we would have the problem of the oceans covered with oil, another undesirable solution. VENTER: They're thoughtful questions. The first, about the concentration of CO2, is relatively easy to deal with. The KMS of the enzymes and these organisms that exist throughout our planet are able to capture CO2 out of the atmosphere, out of the water. But we don't need to rely on that. We have two phenomenal and, soon, a third point source of carbon dioxide. The two largest are power plants and cement factories. If we could simply capture back the CO2 from those two point sources, it makes it very easy because of the incredible concentrations you have there, and will eventually get in a cycle of a renewable source from that. We also have a third. It's a clustered carbon dioxide from a variety of sources that's been discussed to be pumped down into oil wells or coal beds. So, we are working in one of our programs with BP, trying to look at converting that CO2 back into methane, so you could constantly be in a recycling mode. Once you sequester CO2, we could use that as a source of energy instead of constantly taking more out of the ground. So we have so many incredible point sources of CO2 production right now; that's the least of our worries. BROCKMAN: Thank you. Thank you all for coming.